Captain's Log Starship 1XE, Day 14 in the month of April in the Earth Calendar Year of 2016. The snow was blowing sideways. The visibility was variable around ½ mile. Our old familiar Highway 82 was not far below, showing us the way down the Roaring Fork valley once again. I said to my copilot, "copilot, it seems like we have been here before". 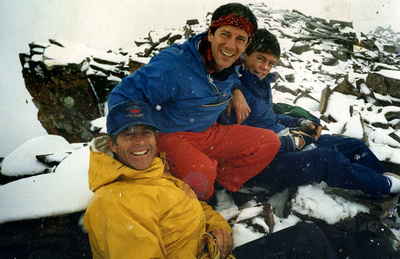 My copilot Peter McBride laughed yes: reminding us of 40 odd years ago when we summited and were stranded for a short while atop Pyramid Peak, as a snowstorm enveloped us. Peter was about 14 years old when he, his father and I perched on an outcropping waiting for the squall to pass. Just like today, the squall passed, and we high-fived and guffawed, and thought well, that was "interesting". On this flight, I am taking Peter back to the Grand Canyon to participate in an extraordinary gathering of tribal leaders on a raft trip down the Grand, highlighting the importance of the river and the environs to tribal culture and their way of life. It was especially interesting and important for Pete who is doing a little known and exciting traverse of the Grand Canyon, in what will undoubtedly be a spectacular article in an upcoming Nat Geo magazine. Peter's work is world renowned and his videos, books and talks on what he calls "Big Red", and rivers in general have inspired much needed attention to this fragile and indomitable landscape and the lifeblood of the West, the Colorado River. I have rafted, walked, and even skied in and out of the Grand Canyon, and there is nowhere more special than this magical place, one of the 7 Natural Wonders of the World. The flight was especially poignant, as we are celebrating the centennial of our National Park System, and this park is under siege as it becomes Disneyfied, with more helicopters than ever rotating over the area, more development, and resource extraction in the form of uranium mining occurring on the rim. There is also a movement afoot to ambush the proposed Greater Grand Canyon Heritage National Monument; a protection designation that will help ensure the Grand Canyon retains its pristine environment. Just last fall, on our most recent Flight Across America student program on the Future of Water in the Western US, we flew over these majestic lands. The highlight for many of our highly educated students was of course the river that sustains the life of the region, and which gave birth to one of our most spectacular national parks, the Grand Canyon. Two student alum encapsulated the trip in this video. We landed at a small strip outside Lee's Ferry, the put-in for the Grand, and were immediately immersed into the honey-colored sandstone of Marble Canyon. Not wanting to reverse course back into the storm swirling in Colorado, we stayed the evening, listening to tales from Steve Hatch (Hatch River Expeditions) about his father who was an avid pilot, and whose family helped pioneer river running in the Grand Canyon, and their "good old days" in Vernal, Utah prior to its latest iteration as an oil and gas town. The next morning, as our accompanying photos show, was absolutely spectacular, as Marble Canyon awoke in all its glory. A reminder of just how special this landscape is. Let all of us who hold this natural world dear, celebrate 100 years of national parks.